As we stated in our comments above in “The Week in Review”, over the past few weeks we have been adjusting our portfolios to align with current market conditions. This has resulted in us shifting to a more defensive mindset. Having started this analysis on a negative tone, it’s important to note that we are still in a long-term bull market and this has not changed. Our bias is still to the long side, but we feel the bull getting “tired” and we are adjusting accordingly. This is the S&P 500 Index (black line) against its 20 month moving average (red line). This helps investors identify the long-term trend. As you can see, with the exception of the head fake in 2011 around the European financial crisis, it has helped identify the big trends for investors. As you can clearly see the long-term trend is from lower left to upper right and that is a good thing. You may be asking, if the long-term trend is still bullish, why are you getting defensive. The short answer is because the market is telling us to. There are certain market sectors that are associated with offense and others with being defensive. In 2013 and the first 60 days of 2014, the offensive sectors were leading the charge higher. But now things are changing and money is flowing into the defensive sectors. 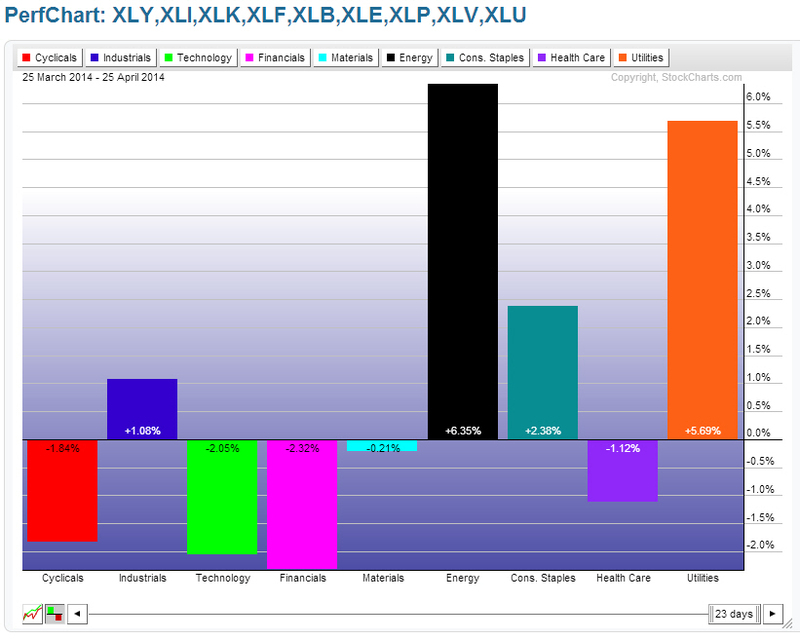 For the last month, energy, utilities and consumer staples have led the market. Utilities and consumer staples are classic defensive sectors that also pay dividends. Energy’s strength is interesting because according to John Murphy over at StockCharts.com when energy leads it often is associated with a market correction. 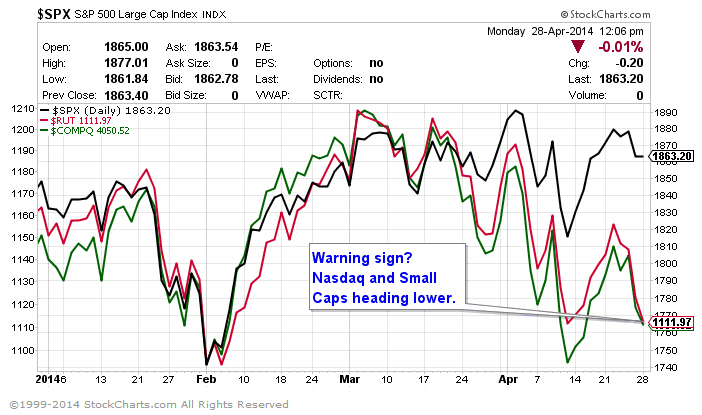 As the chart below shows, the three lowest segments of the market are technology, cyclicals and healthcare. Cyclicals and technology are offensive in nature, while healthcare has been negatively impacted by the selloff in the biotech market. Another important factor that caused us to adjust to a more defensive stance is the fact that the Russell 2000 index has been declining. The Russell 2000 is a benchmark for small caps stocks and has been referred to as the “Canary in the Coal Mine” for the overall stock market. It has a pattern of leading the overall market higher and lower. These are just a few of the data points that have gone into our analysis suggesting a more defensive stance in our advisory portfolios. We stated from the beginning of the year that 2014 will be a much different year than the last. We are anticipating a weak market this summer where we can selectively buy good companies for less than they are trading right now. We know that on average, the market has a 5% pullback 3 times per year, it has a 10% correction once a year, and a 20% correction once every three years. While these are just averages we have not had a 20% correction since the middle of 2011. Are we due for one this year? I cannot tell you with certainty if we will have a 20% correction this year, but what I can tell you is our research says the probability for loss is rising as it projects over the next three to four months. As always, if and when the facts change – so shall we. Right now, the facts suggest a more defensive stance so we will adjust accordingly. In closing, I feel it’s important to remind investors we are still in a bull market until the facts change. We believe this is simply a bull market that needs to pause and catch its breath before regaining its charge higher. As the saying goes, “Good markets follow great markets”, and we expect 2014 to end as a good market.